Elderberries cannot be eaten raw. Not only do they taste terrible, but they contain a small amount of a poisonous alkaloid that can make you sick. Drying elderberries gets rid of the alkaloid and concentrates their unique flavor. Once dry, elderberry has a number of uses. It can be made into an infusion or a tea to relieve cold and flu symptoms. Or, it can be used in a number of recipes. Dried elderberries, if properly stored in the refrigerator, can last up to six months. Wait until elderberry clusters have turned upside down and their fruit is ripe and purple to pick them. Overripe elderberries are unsuitable for drying. Rinse any dirt and debris off the elderberry clusters. Hang the elderberry clusters in a cool, dark place until they are dry. They should be suspended so that their berries hang down. Poke several air holes in a paper sandwich bag and place it over the berry clusters (secure the top of the bag with a rubber band). As the elderberry dries, the bag will catch any berries that fall. Don your gardening gloves and inspect your elderberry plants for rotting fruit and dead and rotting leaves or branches. Remove and discard any rotting fruit or leaves or branches as these attract insect pests. Inspect your plants for insect pests. If pests are found go to your local nursery or home improvement center and purchase a bottle of Bonide All Season Spray Oil or another non-toxic insecticide or insect repelling soap that is recommended by your nurseryman. Fill a spray bottle with your insecticide. From a distance of approximately 6 inches spray your elderberry plants until the leaves are damp and even dripping slightly. Do not rinse the spray off; Bonide sprays are safe to leave on fruits and leaves. Inspect your plants on a weekly basis and re-spray as often as necessary. Continue to remove any dead or rotting fruit or vegetable matter. Collect the blooms from an elderberry plant and allow them to dry on a paper towel for at least 24 to 48 hours. Many health food stores sell dried elderberry flowers if you do not have access to your own flowers. Crush approximately 1 oz. of elderberry blooms and two dried mint leaves into a tea infuser and place the infuser into a tea pot or cup. Fill the tea pot or cup with boiling water and allow the crushed elderberry flowers to steep in the hot water for at least five minutes. Remove the infuser if brewing tea in a cup or pour the steeped tea from the tea pot into a cup. Drink your elderberry tea straight or add a touch of honey for a slightly sweeter taste. Snip the clusters of elderberries just below the fruit. The flowers can also be harvested and saved separately if desired. Place the harvested berries in a bucket, and transfer to a plastic bag when the bucket gets full. The juice can permanently stain clothing if handled carelessly. Carefully separate the berries from the stems. This can be a time-consuming process. Cook the berries in a pan with water, using low heat. Use about 1/4 pint of water and the juice of one lemon for each pound of berries. Add sugar to taste. When the juices begin flowing, simmer about 15 minutes. Strain the mixture through a double layer of cheesecloth. This process is made easier if the cooked mixture is allowed to drain overnight. The resulting mixture can now be used as the basis for making jams and jellies, elderberry wine or, when mixed with whole berries, for pie fillings and other uses. The berries are high in antioxidants. Birds serve as the major pest of elderberries. The University of Missouri Extension notes that more than 45 species of birds eat the fruits of the plant. To combat berry loss to birds, cover ripening berries in netting and harvest them promptly. 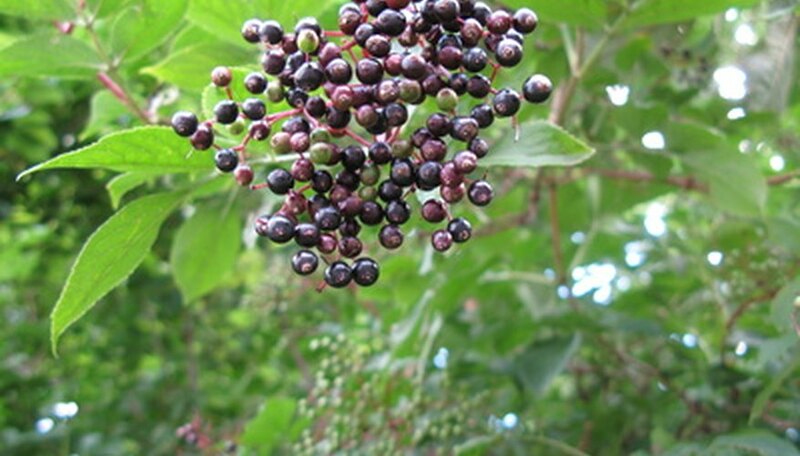 Few insects pose a significant problem for elderberries. In addition to aphids, elder shoot borers and cecropia caterpillars, sawfly larvae, eriophyid mites, fall webworms and the soft scale pest, called the European fruit lecanium, may affect elderberry plants. While birds may compete with humans for a portion of the berry crop, the role of birds extends beyond that of pest. Birds spread the seed in the wild, helping bring about growth of new elderberry plants. Aphids produce a limited amount of damage. Borers can cause the death of elderberry canes, as elder shoot borer larvae enter the elderberry stems, moving into several parts of the plant. The pupa form lives inside dead elderberry canes. 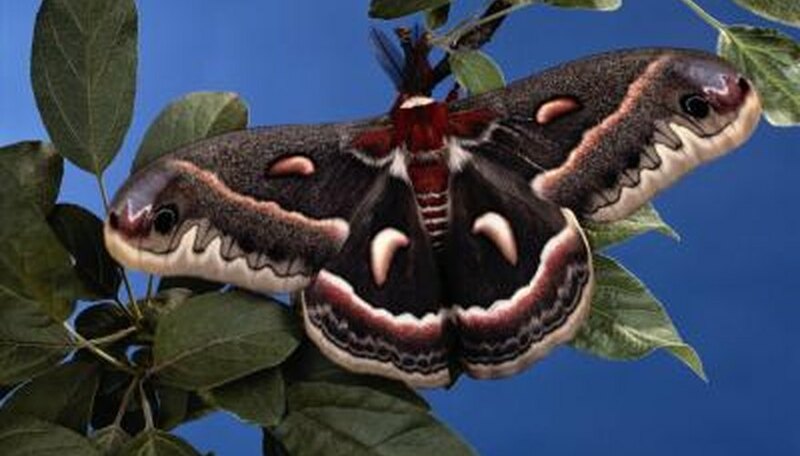 Cecropia moth caterpillars feed on elderberry foliage, and one caterpillar has the potential to eat a great deal of foliage. Water away aphids or prune away aphid-afflicted areas of the plants. Prune out old canes or canes that show signs of borers. Remove cecropia moth caterpillars by hand. According to the University of Kentucky Cooperative Extension Service, few pesticides are labeled for use on elderberry crops.